Imagine being the owner of a successful niche brand with relatively high recognition and strong market share within its category. Your business has been sailing along for about 50 years when, somehow, your brand name becomes the nickname for unwanted electronic mail, something that didn’t exist when your brand first launched. What do you do? In the case of SPAM, the canned meat brand, which debuted in 1937 and became a staple of GIs during World War II, you grin and bear it and keep on branding. And, while that may not be the best strategy for every brand that becomes associated with something undesirable, give SPAM’s owner, Hormel, credit for sticking with the name. SPAM, as you may know, has a few simple ingredients—pork and ham, salt, sugar, potato starch and sodium nitrite. It is basically lunchmeat in a can, and if you have a problem with the healthiness of the product, A) don’t eat it and B) focus your outrage on something like scrapple if you want to save the world from itself. Alas, those same few words from the Viking chorus are credited with the affiliation of the brand name with unwanted electronic mail. Early in the existence of the Internet, some users would flood a site that appeared to be sending unwanted email with the words “Spam, Spam, Spam,” in reference to, or perhaps even in homage to, the Monty Python skit. The word eventually came to refer to undesirable email in general. 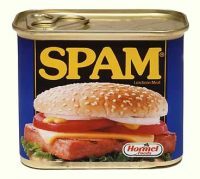 To make matters worse for Hormel, the regulations against spam email became know as the CAN-SPAM act, which, in terms of bad luck for a brand, is about as hilariously bad as it gets. Hormel did not embrace this aspect of their brand name and has largely ignored it. But their product is thriving. SPAM is sold in 44 countries today. It comes in 15 different varieties. It’s especially popular in Hawaii, and has even been made into a form of sushi called SPAM Musubi. For the intensely curious, there is a SPAM Museum in Austin, Minnesota, where loyalists and passersby can view the history of this resilient brand. In 2012, SPAM introduced a mascot of sorts to celebrate their 75 anniversary. He was dubbed Sir Can-A-Lot, in tribute to the Monty Python connection. Their website describes the character of Sir Can-A-Lot as “[what he] lacks in size, he makes up for in bravado. Whether fumbling or composed, he is courageous and determined in his pursuits.” Which is really a great summary of the brand itself. Goofy or serious, sushi or fried, the brand soldiers on and succeeds with just the right amount of good humor. Kudos to you, wonderful, spammity SPAM.